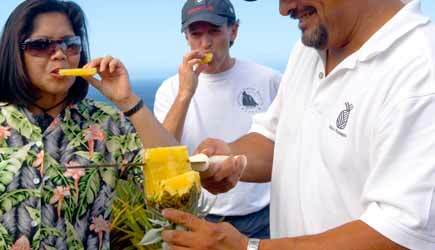 Pineapple is a universally recognized symbol of hospitality and Maui is the world's premier pineapple growing region. Maui Gold速 pineapples are "born and raised" on Maui ... they are extra-sweet and loaded with three times the Vitamin C of traditional pineapples. 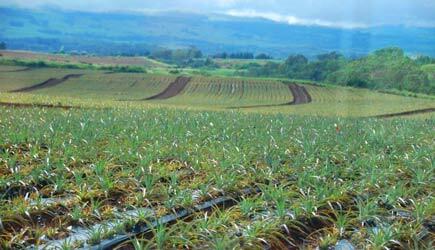 Maui Gold速 and Haliimaile Pineapple Company offer a pineapple plantation tour that is the only one of its kind in the entire nation. 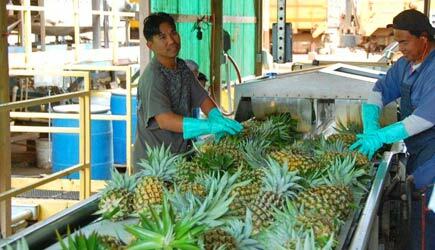 This 1.5 - 2 hour tour is led by pineapple workers whose colorful commentary weaves history, facts and trivia into an authentic pineapple plantation experience. 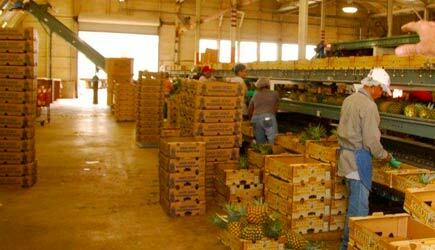 Not only do you get to see and taste pineapples growing in the fields, you also get to see the inside of the packing facility at Haliimaile! Tour participants check in and park at the Hali'imaile Distilling Company ( 883 Hali'imaile Road, Hali'imaile, HI 96768) just south of the upcountry town of Makawao. The distillery is located directly across the street from the Hali'imaile General Store. 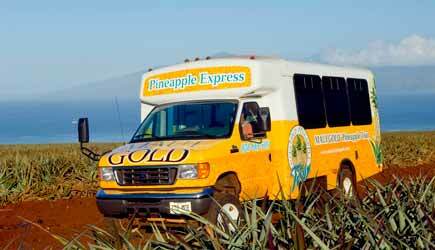 From there you will be transported in the Maui Gold tour vehicle to working pineapple fields in central Maui. Your guide will explain the pineapple growing process, and cut pineapples right from the fields for you to taste the varying stages. You'll learn first-hand why field-ripened pineapple are so much better than most of the ones you find at your grocery store back home. The tour continues with a walk-through look at the unique packing and shipping factory at Haliimaile. All tour participants receive a one free pineapple, all boxed up for you to take home! Additional pineapples and boxes are available for purchase. The Pineapple Tour is held 7 days a week at 9:30am and 11:45am. 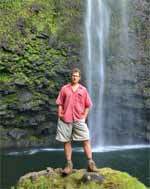 Tour Cost: $65 for adults, $55 for children ages 5-12 (plus 4.166% Hawaii sales tax). Closed toed shoes are recommended. This tour is not advised for anyone with significant neck or back issues as the tour vehicle drives on unpaved and bumpy agricultural roads. Minimum age for children is 2 years. Participants must sign a waiver of risk prior to participation in these tours. We also offer the pineapple tour followed by lunch next door at acclaimed Maui chef Bev Gannon's restaurant called "Haliimaile General Store." 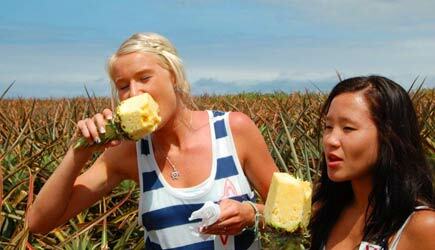 The Pineapple Tour with Lunch is a great value at just $25 more than the regular tour. The lunch option is available MONDAY through FRIDAY. Dessert is a fruit bar of the day, and soda, tea or coffee are included. Selections can be ammended to accommodate special diets or vegetarian requirements. 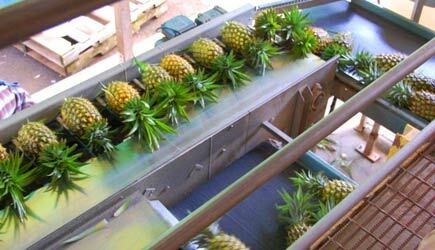 The Pineapple Tour with Lunch is $90 for adults, $80 for children ages 2-12. No children under 2. Lunch option available Monday through Friday at 9:30am only. Maui Pineapple Tours in partnership with Hali'imaile Distilling Company is offering a new addition to the pineapple tour! Hali'imaile Distilling Company is located in the heart of Maui's pineapple region, and they use local ingredients and a unique distilling process to create authentic Hawaiian spirits.The distillery option is available daily. ~ Pau Maui Vodka: The only vodka in the world to be made from pineapples. ~ Paniolo Blended Whiskey: Flavors including Brown Sugar, Coffee, and Chocolate Coconut. ~ Sammy's Beach Bar Rum: Developed for rocker Sammy Hagar. ~ Maui Moon Flavored Vodkas: Pineapple-Orange-Guava and Chocolate-Macadamia Nut. ~ A 10% gift card to be used towards Hali'imaile Distilling Company's retail store. The Pineapple Tour with Distillery is $75 for adults, $55 for children ages 5-12. No children under 2, and you must be 21 and over for the tasting. Distillery option available Monday through Friday. Experience everything: Pineapple Tour, Distillery, and Lunch! This option is available MONDAY through FRIDAY. For the 9:30am tour, you begin with the Pineapple tour, then distillery, and you end with a delicious lunch. For the 11:45am tour, you will start with lunch, then the distillery, and you finish with the pineapple tour. 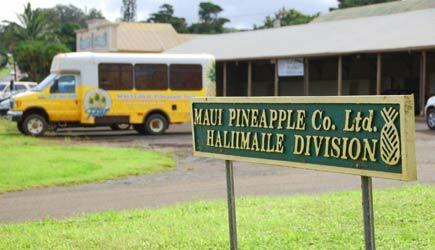 The Pineapple Tour with Distillery and Lunch is $100 for adults, $80 for children ages 2-12. No children under 2 and you must be 21 and over for the tasting. Distillery and lunch option available Monday through Friday. 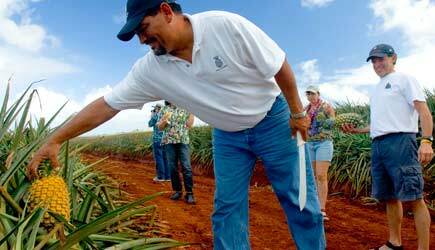 NCL cruise ship passengers in Kahului are able to do the pineapple tour either day in port. Transportation is not included, and is most economically done by renting a car. We can arrange a rental car with shuttle pick-up at the harbor; rates vary throughout the year but start around $40 per day in low season; see our rental car page for more information. Drive time is approx. 20 minutes. Lahaina cruise ship passengers can do the pineapple tour but a rental car is required. Drive time is about an hour and 10 minutes. 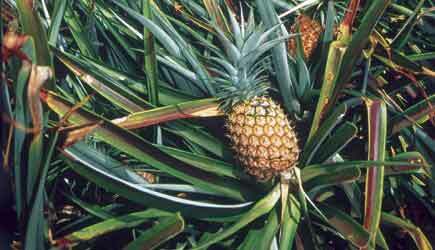 If you've never tasted field ripened pineapple cut open and served fresh while it's still in the field, you've never REALLY tasted pineapple! This experience will make you want to go home and picket the produce department of your local grocery store for having the audacity to sell those flavorless pineapples produced in other parts of the world. Really ... there is no comparison. 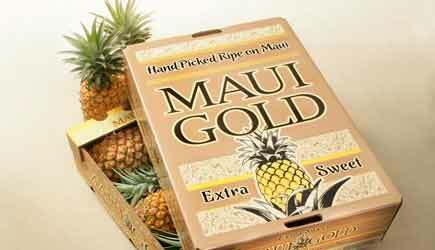 Maui Gold pineapple is the best, and you are likely to want to take some of these babies home with you. Hint: you can pack up a box and ship it home on the airplane as a piece of checked luggage.